In October 2017 we finished building this extension. Now we can offer room for our visitors because every last bed in our house is filled with children. Easter Greetings from all of us at St. Nicholaus! 140 days have passed since my last newsletter for Christmas and this one. And when so many people are living together in one house our days are filled with daily chores, school, the arrival of new children and staff, volunteers and visitors, celebrations, sunshine and rain, power cuts and much more. Between Christmas and New Year we celebrated the inauguration of our St. Francis of Assisi Parish in Kemondo. We had already become a parish a year ago but we had to fulfill a few things until we received the Bishop’s permission to celebrate this event. The celebration was African style: joyful, colorful and with many, many people singing and dancing! Right after New Year, we went with eleven children and seven adults on a trip to Kigoma at Lake Tanganyika. We went swimming every day, the zebras came to our guesthouse and to make sure that this would be an educational trip as well we took the kids to a museum! The children (and the adults as well) enjoyed a wonderful relaxing holiday. It was so good to see the children happy and carefree before they started a new school year on January 9th. The school year in Tanzania begins in January and ends in December. This year we have eight children in Preschool and kindergarten, three children started first grade, and twelve children attending the upper grades. Only six children remain at home. This is because they are either too young or because there is no school in our area that can attend to their special needs. Magdalena and Joseph moved to boarding school. The school insists that all students attend boarding school in their final year so that they are able to study from 5 am until 10 pm without distractions. Hadija has also gone to boarding school. She started first grade at a school for blind and vision impaired children. The first few weeks were difficult for the children and we are missing them greatly. We are happy to have them back for the Easter holidays. Since January, eight children from our house have started with First Communion classes. We used to drive the children to church for their lessons five times a week for an entire year. Having learned my lesson. I have asked the parish priest and the catechist to conduct classes on our compound this year. This saves us a lot of time driving around. The children from the neighborhood also benefit from this arrangement as it saves them walking two miles to church every day. First Communion will be in November. Flavia came to us in December. She is five years old and comes from a difficult family situation. She is going to the same kindergarten class as Kalokola. Because Flavia had been visiting us in the past, it was not difficult for her to adjust. Our newest child is little Editha. She is six years old. She has a Microcephalus, Epilepsy, Cerebral Palsy and a mental disability. In 2012, her parents came with her to our Outpatient Clinic on Saturday for the first time. The family lives in our neighborhood. In 2013, the father committed suicide. Since then the mother is raising the four children by herself. At one point, she stopped taking Editha to our Saturday clinic. Instead she would sent Editha`s older sister. In the past five years we watched how Editha`s condition worsened despite our efforts to support the family. The mother had given up on Editha and did not respond to our pleas and offers of help. So finally, in February we took Editha in. She weighed only 15 lbs! The first two nights she cried for several hours, which surprised us. It clearly shows that she notices much more of what is going on around her than what we initially thought. Today, Editha is very happy at our house. With open eyes and ears she is observing everything that is going on around her. So far, she has gained 5 lbs. Despite her severe disabilities, she is in good health. It is such a joy to see how a little bundle becomes a laughing child. She is the 29th little sunshine in our house! Besides two new children, we also welcomed three new staff to our house. Between July 2016 and Easter we had seven volunteers and eighteen guests from Germany, Switzerland and the USA. All those people bring a lot of joy and excitement. However, our daily lives go on nevertheless. Lent had a special surprise of fasting for us: Tanesco, the Tanzanian power company gave us numerous power cuts: first for five days in a row, later for nine days. In Tanzania, life goes on without electrical power but it does slow down many areas of (work-) life. In the Western world, this would have called for a state of emergency. On a positive note, one could also say that Tanzania is setting a good example for protecting the environment. Other countries only switch off their lights for one hour and make sure it is broadcasted in the media. However, we were blessed to get solar light recently so that we do not have to sit in a dark house in the mornings and evenings trying to find our way with the light of a cell phone. We also have a generator that runs the washing machine. Boniface, our youngest has learned to say the word „generator“. What a vocabulary for a two-year old! At the same time as we experienced the prolonged power cuts the rain season was in full force and all our kids and caregivers came down with colds. But sooner or later, the sun shines again, the power comes back and the snot has dried up. Another reason to look forward to the Easter holidays! The week before Easter, we took the older children, two caregivers and volunteers to Musoma to visit Maria and Steven who have been living there since August. It was good to see them again. On the way home, we had a special surprise for the children: We went to the Serengeti to see Tanzania’s wildlife! The entrance fee to the National Park is only $ 1 per child but we had never been there because it is such a long drive. Tanzania is a very big country. We were traveling for five days but the excitement of the kids made it worth it! Before I close this letter, I would like to share some news that is sad for me personally as well as for many in Kemondo and in the Bukoba Diocese. San Damiano Mission, which Sr. Anne and I started and built in 1999, will be closing. After eighteen years serving in the mission, Sr. Anne will return to the USA. The three Indian Sisters who have been serving at the mission with her for nine years will return to India. 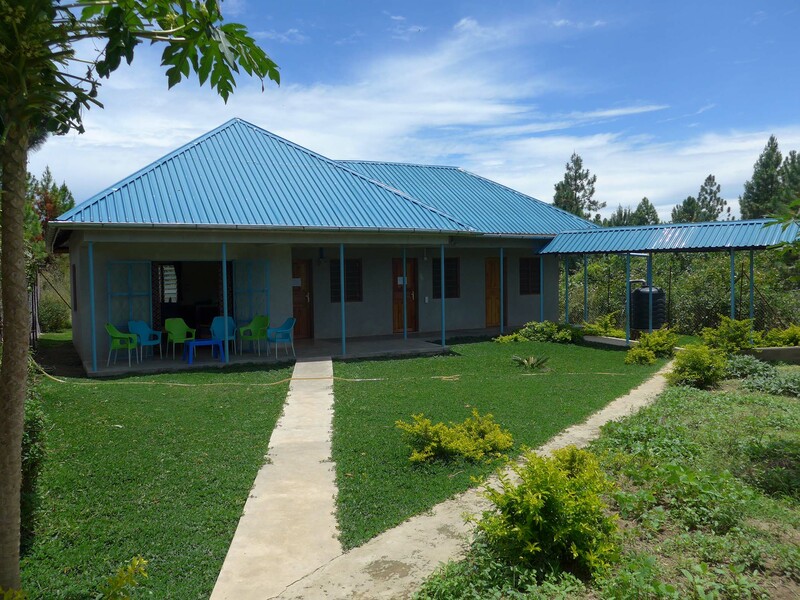 The Sisters` house will be handed over to the Diocese of Bukoba. At this point, it has not been decided yet who will continue the Sisters‘ ministries. The farewell will be in Mid May. Many people will be very sad to see the Sisters go. We are wishing all of you a joyful Feast of the Resurrection! Please do not send us any more packages to St. Nicholaus! We know that you mean well but the Tanzanian law has changed recently. From now on ALL packages are opened by customs and they charge us 50 % of the value stated on the package. In order to get the package, we have to make three trips to the post office, three trips to customs and one trip to the bank to make the payment. We run around town for two hours for this and have to pay a lot of money. Food, medicine and cosmetics cannot be sent at all. Such items require special custom forms and permits which are impossible to get. So please never send these items. 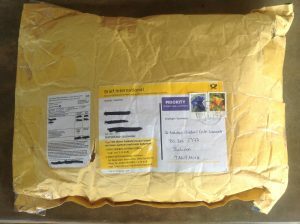 However, you can still send us small things in padded envelops (see picture as an example). Those are no trouble at all and do not get opened by customs. Please write: „Donated Used Items Value $ 0“ on the custom’s slip. Dear Friends and Supporters of St. Nicholaus Children`s Center! On Saturday, September 10 at 3:27 pm we had an earthquake of the magnitude of 5.7 on the Richter scale. The children were off from school and all were home. Most children were outside or quickly ran outside. No one was hurt. Our house is still standing. However, we were literally „shaken up“. Many people did not realize immediately what was happening. For most people it was the first time in their lives that they experienced an earthquake. This region has never had a major quake. Most likely, there is no connection between the nuclear test in North Korea on September 9 and the earthquake in our region a day later since both countries are far apart from each other but this rather strong tremor was very unusual. The geological fault line in the Great Rift Valley might have triggered the tremor. Around 10 pm on September 11, we had an aftershock. People responded to this with great alarm. People are tense and afraid of further aftershocks or another earthquake. The quake epicenter was near Bukoba town. The town itself has been affected greatly. 16 people died, more than 250 people were hurt. The quake could also be felt in our neighboring countries Uganda, Rwanda, Burundi, Kenya and the Congo. The vice president came to Bukoba for a memorial service. Because of the poor building structure, more than 800 buildings collapsed and over 1000 houses were seriously damaged. Even at St. Nicholaus we have cracks in the walls but our structure is safe. The whole extent of the damages has not been counted yet and getting help for those who lost their homes is slow to come. The local hospitals have neither emergency nor intensive care units. Therefore, any catastrophe easily overwhelms the capacity of the hospitals. The Tanzania Red Cross Society was on the ground and provided first aid assistance. In sum, we can say that after all God has protected us because it could have hit us more severely. For more information, please refer to the Internet articles attached. St. Nicholaus Children`s Center celebrated its 5th birthday! On September 17, 2011 we moved in with our first 10 children. We wanted to remember this day with a Mass of Thanksgiving. We invited only a few guests: The families of our children, our neighbors, people from the parish, priests and Sisters, and supporters of our center. The invitation list grew to over 50 people, together with our almost 30 children and more than 20 employees, it quickly added up to more than 100 people. There is no such a thing as a small celebration in Africa because Africa`s greatest wealth is its people. It was a beautiful day: Bischop Method Kilaini celebrated Mass together with our parish priest Fr. Justus Kahwa and two other priests from neighboring parishes. It did not rain (! ), we had electricity, and music and good food, and our children sang and danced. Everybody was in a happy mood. It was a feast for all the families with disabled children. It was for the first time that in August we had to say good-bye to two of our children. Maria (19) and Steven (13) had been with us since we moved into St. Nicholaus. I had taken both children away from their family because the parents could not care for their mentally and physically challenged children. I have known Steven since he was born. For the first two years of his life, he was raised in an orphanage for infants. Then he moved to a nearby hospital because at that time there was no institution who would accept him until we finally opened St. Nicholaus. I have known Maria since 2001. She was 4.5 years old then. In 2005, the mother left Maria and her three younger siblings with the father. In 2006, Maria`s condition had worsened due to neglect and I looked for a foster mother to care for Maria. For eight years, Helswida took care of Maria. Today Helswida is one of our caregivers. Helswida, I and everybody who got to know Maria and Steven had a hard time to say good-bye to them and to let them go. However ultimately, we are a home for children and considering her age Maria is no longer a child. For a long time I had to look for a home for adults with disabilities because, there is no such a place in our area. Fr. Biseko from the Charity Home Kigera in Musoma offered to take both children in order not to separate the siblings. Unfortunately, Musoma is far away from our place. Door to door, it was exactly 400 mi. Nowadays, all the main roads are paved in Tanzania but they are not interstates. Children, people, cows, goats are walking alongside the road. There are no sidewalks for people and many die on the roads. When I am traveling, I am grateful for every accident free mile. It took us 13 hours each way to cover the 400 mi. Musoma is across Bukoba on the opposite side of lake Victoria. But there are no ferries connecting the towns. 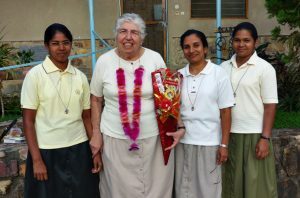 The community of Franciscan Sisters who are working at St. Nicholaus are also ministering in Musoma and at least through this connection we get news on Maria and Steven. I am planning to visit them in November. If it were not so far away, we would have visited them already with all our kids. In August and September, we received two new children: Both are blind and both have been abandoned by their mothers but the children are not related. Hadija is 7 years old. We first met her in 2012. At that time, her mother asked us for advice and help. We s ent mother and daughter to an eye doctor. Hadija was born prematurely and her eyes had not fully developed yet. There is nothing to help her eyesight. Four years later on a Thursday afternoon in August the mother returned with Hadija. She wanted to talk to me but I was not in my office at that moment. Therefore, she went to another home for children nearby but did not meet anybody in charge to talk to either. Apparently she just left Hadija on the compound of the other children`s home and left. The night guard noticed Hadija several hours later. The next morning the wife of the director of this children`s home took Hadija to our house. I recognized the child. I register every disabled child that is taken to our clinic. I found her file and with the information we had on this file we could identify and locate her mother. We looked for the mother, found her and took her to the small police station that we have in Kemondo. The police advised us to take her to the main police station in Bukoba town where she would be put in prison and where her case would be taken to court. Hadija`s mother was with her 3-year old daughter on her back. I hesitated to follow up with this case considering the impact it would have on the lives of a number of people. Instead, my caregivers and I tried to talk with the mother several times. Finally, she told us that she is HIV positive, a single mother of three. I presume she has been depressed, has not been feeling well physically and has been overwhelmed. Her oldest daughter is already living with relatives. For several days, I tried calling the social worker from the Department of Social Welfare in Bukoba town to ask for advice. But the social worker had no time to receive my phone calls and hung up on me, and never returned any of my calls. In the end, we decided to accept Hadija into our center. In January, when the new school year starts in Tanzania, we want to enroll her in a special school for blind children. Since Hadija has been with us, the situation with the mother has improved. The mother calls me to ask how Hadija is doing and she has visited her daughter several times already. By now, Hadija is used to us and she is a smart, happy girl. She knows how to distinguish people by their voices and how to find her way around. She is easy to love. Atugonza joined us in September. She too is blind. Her mother abandoned her. People found her and took her to the Department of Social Welfare. This was back in March. The social worker took her to an orphanage for infants. We don`t know Atugonza`s exact age. We don`t even know her name. The caregivers in the other orphanage named her. Considering her height and her level of development, we are guessing her to be about three years old. Her behavior is alarming because she likes to bite and pinch herself and others. When talked to she does not respond but repeats the sentence she just heard. But we don`t know what she went through until she came to live in the other orphanage in March 2016. Right now she is still getting used to us. The Department of Social Welfare found her mother and she has been put in prison for one year. This general letter has become quite lengthy and I have not even finished sharing everything! One event follows the next and life is never boring in our house. In July, 96 youth received the sacrament of confirmation in our parish, 7 teens are from St. Nicholaus. 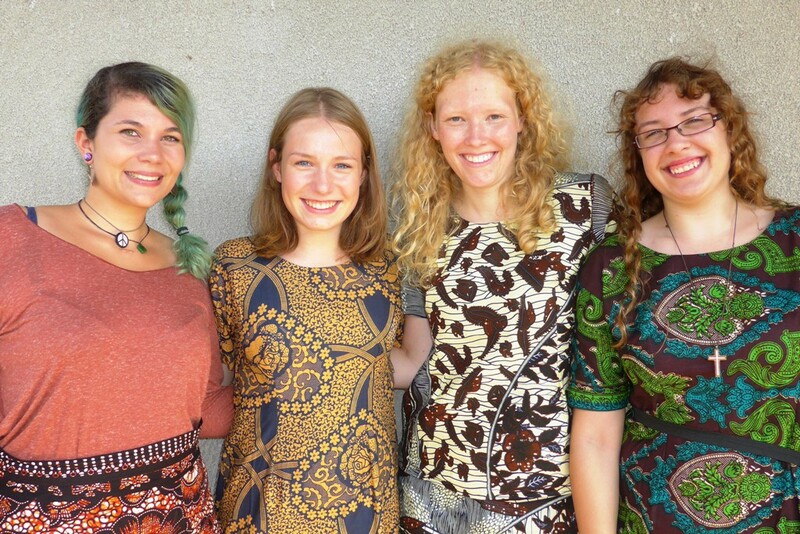 In July, August and September we four new volunteers from Germany joined us. The volunteers are playing with the kids, helping them with their homework and tutor them in math. They are a big help to us. And finally, I have found a male caregiver for my three boys Christoph, Ashraf and Mtagwaba. Caring for them – especially lifting them – has become increasingly difficult for our female caregivers. I am happy that Eladius is a physically strong young man who has a big heart to care for the children and to be a good male role model for my boys. We are waiting for the rain season. After four months without rain, the soil is totally dried out. Every surface that is not wiped cleaned every day is covered with a thick layer of dust. The air is dusty, we are breathing in the dust, we have dust in the ears and nose. Thanks to our new well that is 164 ft deep we have been blessed with water throughout the dry season. It is easy to understand why our neighbors have been secretly steeling water from the backside of our water tank! It is time to plant but the rain is not coming. Thank you so much for your faithful support. Without you, we could not help our children!